From the three Modi Juicy Nails nail polishes that I have bought, I have already shown you no. 19 - Cherry Glaze and no. 21 - Party Pink. 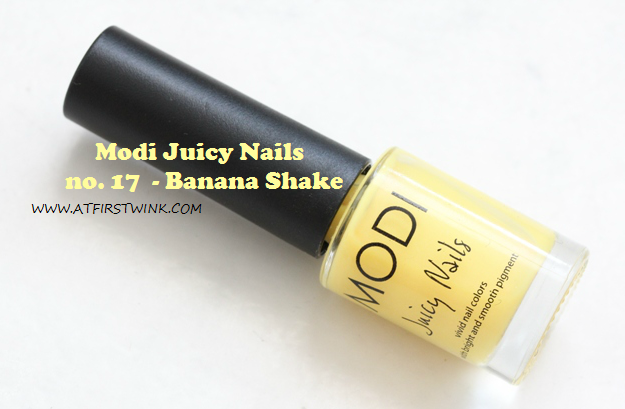 Now, I only have Modi Juicy Nails nail polish no. 17 - Banana Shake left to show you. I kind of wanted it to be sheer and glossy, but it didn't look nice with one or two coats. I think it looks the best, when it is fully opaque after three coats. You can decide how you like it yourself since this time, I took a picture after applying each coat. Again three coats, but from afar.